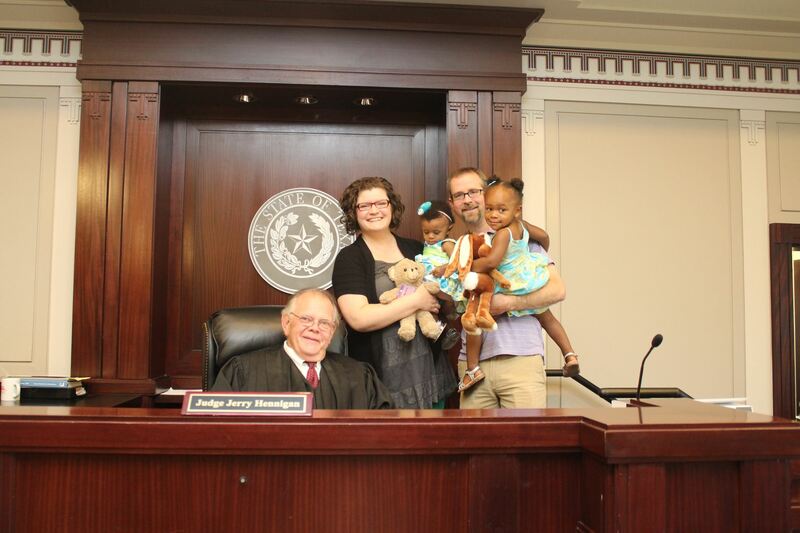 I had the honor and privilege of being present for the finalization of my niece Cora’s adoption. I was pleasantly suprised to hear that vows my sister Erin and brother-in-law Jody were asked to recite. The had to promise to love her, care for her and be her (Mom/ Daddy) for the rest of their lives. It reminded me in some ways of a wedding ceremony. These promises came easily to the sweet couple. They promised those things – and more – to God, an adoption agency, and a birth mother long before they brought Cora home from the hospital 6 months ago. She has been a Cason since she was just a hope and a prayer – just like her sister Olivia. So now the Cason family has 2 precious daughters, who could not be more loved if they had been conceived and born of Erin and Jody’s DNA. Their bonds are stronger than flesh and blood. As the moldy oldie song says, “love will keep” them together. Where Erin and Jody had Olivia and Cora-shaped holes in their hearts, they now have beautiful daughters. Where 2 babies had no family, they now have a Daddy and a Mama and each other. All this has reminded me this week of my adoption into God’s family. Galatians 4:4-7 says, “But when the fullness of the time came, God sent forth His Son, born of a woman, born under the Law, so that He might redeem those who were under the Law, that we might receive the adoption as sons. Because you are sons, God has sent forth the Spirit of His Son into our hearts, crying, ‘Abba! Father!’ Therefore you are no longer a slave, but a son; and if a son, then an heir through God” None of us have done or can do anything to deserve God’s love. We are simply born. And He has a YOU shaped hole in his heart. And he waits for you. Just as an adoptive parent waits for a child. He waits for you to come to know His Son. And when you do, He sees you as He sees Jesus – as His child. Because Jesus covers over all the sin and ugliness about us with His goodness and righteousness. We become more like Him. And we enter into the family of God. A forever family. A family that lasts past what we can even understand as forever. And long before we took our first breaths, our Heavenly Father promised to love us, care for us, and be our Daddy (Abba) forever. You don’t need to go before a judge to make it official today. All you have to do is ask Him to forgive you of your sins and be your Daddy forever. If you have questions, I would love to talk to you about having a relationship with Jesus. Please send me a note. Nothing would make me happier than for us to be adopted into the same family!